Dive Indonesia by liveaboard and experience diving some of the world’s top rated dive sites in comfort and ease. The S/Y Indo Siren is not only owned and managed by Worldwide Dive and Sail but was built by our team to ensure every thought for the modern diver has been taken into account. Our fun and friendly crew offer attentive personal service and will go out of their way to make your time aboard truly memorable. The 40 metre S/Y Indo Siren was custom-built by our own team and launched in April 2011. The cabins are doubles and twins and we offer flexibility with 2 cabins which can be converted from twin to double to suit the needs of our guests. Our generous outdoor dining area offers a great setting for all your meals. The dive deck is perhaps the most spacious and comfortable you will have ever experienced. S/Y Indo Siren has designated indoor and outdoor workstations for charging, preparation and maintenance of your camera and video equipment. Large storage drawers for your peripheral items are available, as well as numerous charging points, with adapters available (sockets are 2-pin European style at 220V or 110V) Naturally, we also have large rinse tanks with fresh water solely for camera and video equipment – the S/Y Indo Siren truly sets out to be the pros choice for underwater photography and videography. NOTE: All on board prices are listed in USD and we are pleased to accept cash payment in USD, Euro, US$, GBP, AU$ or Indonesian Rupiah (IDR). We can also accept payment by credit card (Mastercard or Visa only) for which there is a 3% admin fee. All credit card payments will be billed in IDR using the rate of exchange at the time of your trip. Discover the layout before you arrive! Worldwide Dive and Sail considers the safety of our guests and crew the preeminent issue aboard our yachts. The S/Y Indo Siren has been constructed to the highest standards using top-graded materials. She is equipped with the latest safety features including Automated Life Rafts, Life Jackets, Fire Extinguishers, Smoke Alarms, Emergency Long Distance Radio, Satellite Phones and EPIRB. 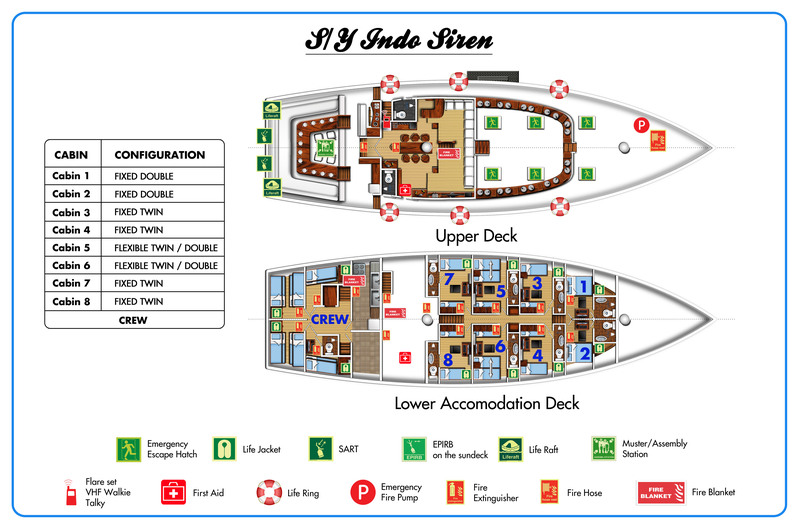 Each crew member of the S/Y Indo Siren has received extensive training in all aspects of safety, emergency management and evacuation procedures. Our crew keep their skills fresh and up to date with regular practice drills. The dive team are all emergency medical responders and on board you will find a fully stocked medical box for treating minor ailments and injuries, along with a full supply of medical grade oxygen and DAN Oxygen provider kits. Upon boarding, guests will be requested to try out life jackets and briefed on emergency procedures by our cruise director. All guests should ensure they have adequate dive and travel insurance from a reputable supplier such as DAN or ask our team about DiveAssure. Aboard the S/Y Indo Siren you can be confident in our ability to provide care and safety of the highest standards. We were treated like royalty! Rooms made beautifully. Tristan and Laura did a surperb job looking after me, they were engaging, attentive and ran the boat beautifully. They strengthen the Siren brand and give me the reason to sign on again! I would highly recommend them to run any of your cruises. I cant recommend this trip highly enough! Tristan and Laura didn’t just run a well oilded machine – they made this the trip of a life time. We got to experience very challenging conditions and yet they were always in full control, making the right calls when needed and adapting to the environment. Even though most of the group were dive masters or instructors, they still set themselves as the leaders that everyone could rely on. I would love to dive with Tristan and Laura again and happy to put my name down as one of their most satisfied customers. See you soo Siren Fleet! Awesome crew, everyone is an outstanding ambassador for your brand! Food far above expectations for a liveaboard. Congrats to the kitchen team! Spacious rooms, excellent service, brilliant location, amazing dive sites. 5 stars. The crew, the detail, the knowledge, the safety, all excellent. The cruise director Luke was the best I have ever had, he made the trip enjoyable and easy. All the staff was excellent. Annie and Ing were exceptional as well.